Category Archives for "Blackberry 10"
JaredCo’s One Touch Flashlight, rated a top five Blackberry app by Fortune Magazine, is now available for the new Z10 smartphone. One Touch Flashlight uses BlackBerry video light, instead of the dim LED screen light, to deliver more light quickly. With more than 4,000 reviews, One Touch Flashlight is the most downloaded flashlight app of all time on Blackberry® World™, said The Jared Company founder and CEO Steven Kader. · It uses less power than other flashlight apps. · A one-touch on/off icon for the flashlight allows for easy access to the light fast. · It also works on the Blackberry Playbook. We recently announced that our exceedingly popular free wallpapers are available for BB10 and the Blackberry Playbook and that the highest-rated free weather app on Blackberry World, WeatherTrax,is now available for BB10. 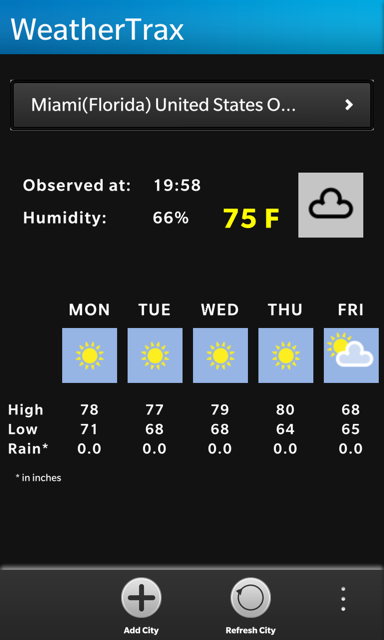 JaredCo’s WeatherTrax, the highest-rated weather app on Blackberry® World™, is now available for the the new Z10 smartphone. WeatherTrax is a free app with new features for the Blackberry 10 OS, including faster speed, smoother searches and the optional function to update BBM™ personal messages with current weather. The display shows a detailed forecast for the current day and the weather forecast for the next five days. WeatherTrax can use the BlackBerry® GPS for real-time weather reports for the user’s current location. The user has the option to switch from Celsius to Fahrenheit. Locations can be stored and easily deleted later. A convenient drop-down menu provides current weather conditions for locations world-wide. WeatherTrax is available for free at http://appworld.blackberry.com/webstore/content/12603. We also recently announced that our exceedingly popular free wallpapers are available for BB10 and the Blackberry Playbook. We will soon be announcing numerous other BB10 apps. We are gearing up for the launch of the new Blackberry 10 OS in a few weeks, today announcing that our exceedingly popular free wallpapers will be available for BB10 and the Blackberry Playbook. Research in Motion has said it will launch at least six BB10 devices this year. Our recent survey of 6,000 of its customers using our Blackberry apps revealed that nearly 70 percent of the survey respondents said they plan to buy a BB10 when they are ready to replace their current BlackBerry smartphone. Our unique free wallpapers automatically scale the wallpaper for each device. Our free wallpaper app for the current Blackberry smartphones is among our most popular. With mobile devices an essential part of daily life, more and more people seek to personalize them as an extension of their personalities. With The Jared Company wallpapers, select a “look” from dozens of options, and it can be completely customized—including pattern and color. New wallpapers are added frequently. Thumbnails are low resolution to minimize data transfer for those who pay for data. It doesn’t change shape or distort the image like other BlackBerry wallpaper apps. It syncs with a couple of clicks and a tap in just minutes. Visit Blackberry App World to download the free app.